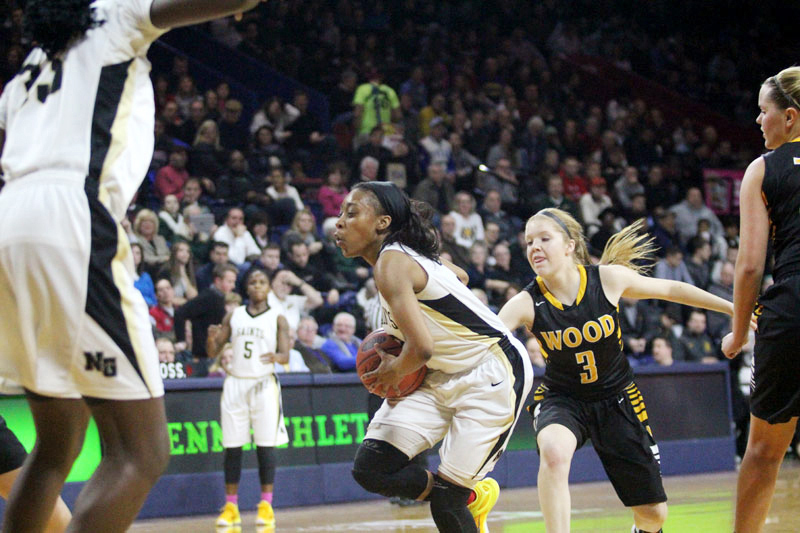 Sianni Martin (left) of Neumann-Goretti drives to the basket past Archbishop Wood's Shannon May. Those who figured that Archbishop Wood would come close to defeating Neumann-Goretti in Monday night’s Catholic League girls’ championship at a spirited Palestra, raise your hands. After defeating the Vikings by 59-33 during the regular season, entering the league final with a perfect 23-0 record, and being ranked the top high school team in the entire nation, the only valid hope for unbiased fans was for the Vikings to at least keep the contest somewhat close. But in the end, Neumann-Goretti outlasted its effort-filled opponent, 50-45, and captured its second straight Catholic League crown. Unfortunately, journalistic principles require a reminder that these two teams have been awash in controversy because of the purported deeds of former Wood coach John Gallagher, who during the season allegedly sent anonymous emails that disparaged the Neumann-Goretti program, in particular current players who were set to begin playing college next fall. Gallagher resigned earlier this month and was replaced by assistant Mike McDonald. With pending lawsuits and an ongoing investigation, no one from either program said he or she was allowed to speak about the situation. Coaches and players said they would, however, be happy to talk about the championship. Archbishop Wood, which lost to N-G in last season’s final, came out with a swagger and trailed by only 16-15 after one quarter. The protagonist behind the Vikings’ impressive first stanza was junior first-team All-Catholic Bailey Greenberg. The 5-10 swingman scored 11 of her eventual 24 points over the first eight minutes. 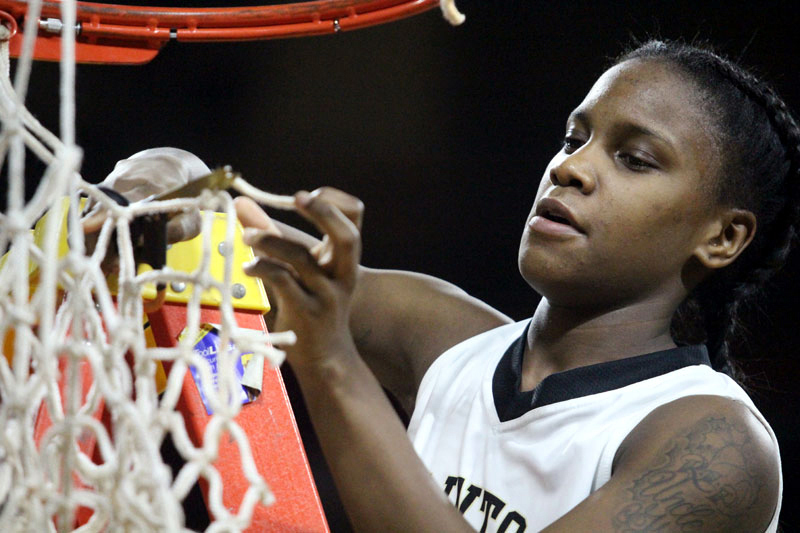 Though senior Aubree Brown (eight points) was also a steadfast performer, it was Greenberg’s contribution that kept Neumann-Goretti from pulling away to a comfortable lead. Led by Cryor and junior Kimayah Smalls (team-high 14 points), the Saints scored the first eight points of the second quarter and, on a three-pointer by Smalls seconds before halftime, led 31-20 at intermission. The Vikings (21-4 overall) followed their coach’s mandate. They edged to within 39-35 on a three-pointer by Greenberg with 15 seconds left in the third, but the Saints responded on a buzzer-beater by Smalls after a scrum somehow did not result in a jump ball. In the fourth, Greenberg connected on two buckets to trim N-G’s lead to 43-41 with 5:00 left. The Wood crowd was going berserk. A three-point play by senior Sienni Martin put the Saints up by five, but Greenberg’s two free throws lowered the advantage to three. Two free throws by Smalls made it 48-43, but a pretty drive down the lane by Brown again cut the lead to three. With 22 seconds left, N-G missed the front end of a one-and-one, and the Vikings had a chance to tie. But a missed three-point attempt and inability to snare the rebound gave N-G the ball with a three-point lead and only 3.2 seconds left. The Saints ended all suspense when Smalls caught a length-wide pass and dropped in a superfluous basket at the buzzer. Greenberg lauded the Saints for their gritty defense and torrid shooting. She also expressed affirmation for her teammates. “They weren’t missing,” Greenberg said of the Saints. “We would get close but they kept hitting their shots. Nothing much we could do about that. As a little girl, Greenberg used to shoot around at the Palestra when her aunt and Wood alum Kelly Greenberg coached at the University of Pennsylvania from 1999 through 2004.